Care of the sick was an immediate need, a role left primarily to the women of the family, and most common illnesses were treated with home remedies brewed of barks, herbs, or common household solutions. A doctor or midwife was called to assist in childbirth or more serious illnesses. 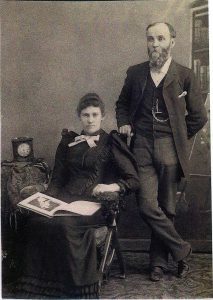 That calling first fell to Sarah McKee Davis, wife of William Davis, who had learned medicine as the daughter of a skilled physician and surgeon. “From Malad to the north to Willard to the south, she went at all hours, in all kinds of conveyances, to relieve suffering.” 1Lydia Walker Forsgren, History of Box Elder County, (Brigham City: Daughters of Utah Pioneers, 1937), 162. 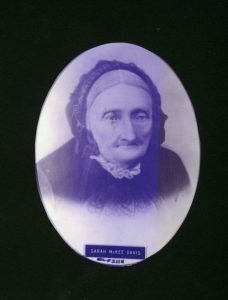 Ann Thomas, wife of William Thomas, also served the health needs of people of Brigham City and the “north string” where she lived. Nancy Wight, wife of Lewis Wight, was a skilled midwife and cared for more than 1,000 mothers and babies during her years of practice. Other midwives were Caroline Ipsen, Mrs. (?) Anderson, Safina Hansen, Sarah S. Burbank, Margaret Ann Bennet, and Mrs. Amanda Tippets. 2 Forsgren, 163. Probably the best-known of local midwives was Ane Cecilia (Aunt Celie) Nielsen, who delivered some 1,800 babies. She had been delivering babies since 1867 when she decided to enroll in obstetrics and nursing classes offered by the Relief Society in 1884 and continued with renewed vigor. The standard fee for a ten-day confinement and delivery was five dollars. Her patients started a tradition of delivering a cake to her on a special plate, which she kept in her collection. She wrote the name of the baby on the plate, and in her later years returned many plates to grown-up babies she had delivered.3Sarah Yates, “Many were dedicated in early medicine,” Box Elder Journal, (Brigham City: July 15, 1976), 9. The story is based on an interview with Daisy O. Hansen, who was the recipient of one of the plates. 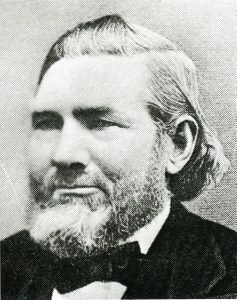 Samuel Smith41818-1895, later mayor of Brigham Cityserved many roles in the community and one was as a self-described “doctor” and druggist, based primarily through his diagnosis and prescription of medicines sold from his general store on the northwest corner of Main and Forest Street. College in Chicago to return in about six weeks with a medical diploma. His wife of three weeks tended the store during his absence and they remained in business until 1872 when he sold his stock to L.T. Peirce and moved to Logan. Dr. W. A. Wade opened a drugstore soon afterwards, but sold it to William Driver to enter full medical practice.5Yates, 9. 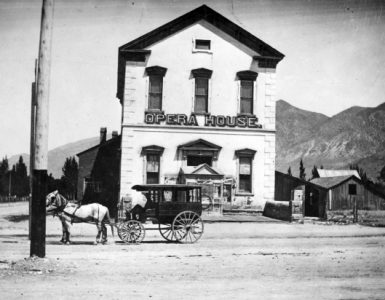 Brigham City had its share of the traveling medicine shows popular throughout the country. Hucksters offered potions that would take care of female complaints, catarrh, dyspepsia, coughs, and consumption — all in one bottle. Usually, the main ingredient was alcohol, which gave the user a feeling of well-being, as well as relieving pain. Most pioneer homes kept brandy and elderberry wine for medicinal purposes. Some of the patent medicines, such as Dr. Pierce’s Women’s Tonic, could be purchased in drug stores, as could quinine, castor oil, sulphur, calomel, morphine, cocaine, and opium without prescriptions.6Yates, 9. Child and infant mortality were high. 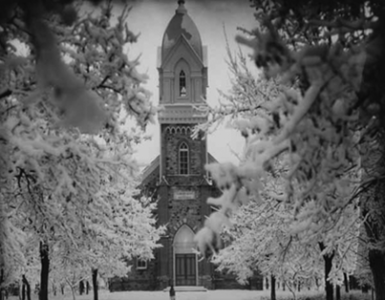 Measles, whooping cough, influenza, typhoid, cholera, diphtheria, and “leakage of the heart” caused many a small casket to be lowered into the city cemetery. Some were isolated cases, but various epidemics broke out in the city through the years, often due to the use of open ditches for drinking water. Smallpox was a terrifying disease, killing or scarring its victims. Although vaccination was being practiced in the East, it was not yet common in the West. Due to the highly contagious nature of the disease, the city deemed it necessary to build a special house where victims could be quarantined. A small log cabin was built at the base of the “sand hill” near the mouth of the canyon, and fenced off so no one would wander in by mistake. The patient’s family provided food, clothing, and bedding. A relative or person who had already had the diseases delivered provisions and nursed the patient.7Yates, 9.